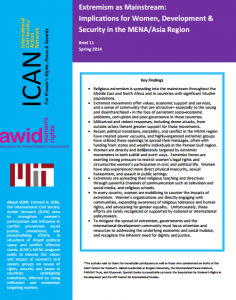 In 2013, ICAN, in partnership with the MIT Center for International Studies and the Association for Women’s Rights in Development (AWID), hosted a two-day roundtable to better understand rising religious extremism from a gendered and grounds-up perspective, highlighting the essential yet often overlooked implications for women and the efforts of civil society on the ground. The meeting included civil society practitioners, scholars and journalists with expertise from Canada, Pakistan, Malaysia, Egypt, Yemen, Tunisia, the United States, and Iran. The roundtable addressed a range of questions. The statements and perspectives included here reflect views shared during the roundtable, and related research and analysis by ICAN. While this brief cannot do justice to the depth and complexity of the discussions, it is intended as a catalyst to widen the space for discussion, research, policy and practice among international and national level scholars and practitioners.